The experts have different opinions about which country will lead the tally of best immigrant friendly countries in 2017. However, when it comes to the place of Canada, everyone agrees unanimously that Canada will surely among the top countries. Canada has traditionally been the best immigrant friendly country in the world and year 2017 is not going to be different by any means. If you also aspire to get Canadian Permanent Residency (PR) in 2017, here are the key tips to obtain the same in a trouble free manner. Canada Immigration is the wise thing to plan next year in view of various relaxations provided by the government for the applicants. Moreover, Canada’s annual immigration target is quite high, which is another encouraging factor for thousands of aspirants planning to get PR in Canada next year. 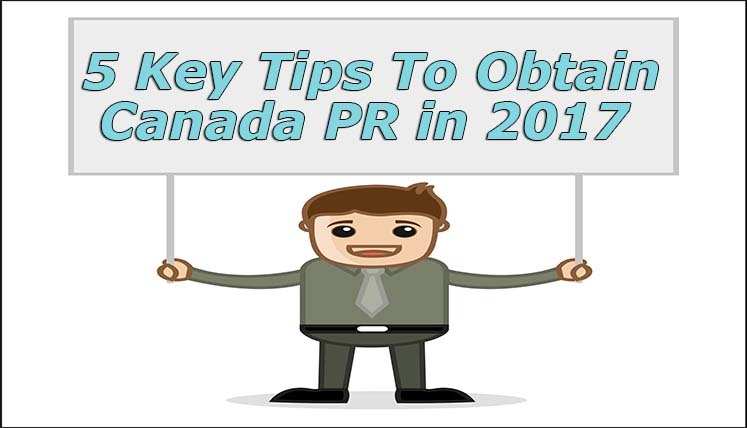 Here are the key tips to get Canada PR in 2017. As you plan immigration to Canada in 2017, you must acquire the complete information and understanding about the immigration process and series of steps involved in the same. If you are a layman and don’t have much of the idea about immigration and guidelines, it’s better to take services from a trusted Canadian Immigration Consultancy Service. Apart from confirming and collecting the general documents, i.e. birth and marriage certificates, passport, educational and work experience related documents, etc., you also require gathering the key documents needed to in the relevant Canada Immigration programs. The key documents required to apply in popular Express entry system of Canada include IETLS test result for English Proficiency, Educational Credential Assessment (ECA), etc. In the year 2016, various key changes have been made in the Canada immigration process and rules. These changes have been made in the popular express entry system of Canada, processing time, family reunification process, immigration point system, etc. Keep track of all the key changes made to prepare yourself well for immigration to Canada. If you are coordinating with an immigration consultant, it becomes really helpful to know all the procedural changes and updates. There is immense competition for Canadian PR every year, as thousands of candidates apply for the same every year. If you want to enhance your chances of selection, you must prepare your immigration file well in advance to apply first and accurately with all the essential documents intact. You may also seek help and assistance from a genuine and reliable Canadian Visa Consultancy Service to prepare your immigration file in advance. How to find genuine & trusted Canadian Visa Consultant for immigration assistance? If you want to prepare your file to get Canadian PR in 2017 under the certified migration expert for Canada, you may contact Visas Avenue Immigration. The Visas Avenue is a popular and registered Canada Immigration Consultancy Service in India. It provides customized immigration solutions to immigrate to and get PR in Canada to a huge number of applicants every year. To speak to the expert at Visas Avenue for immigration help, you may call at 011-48447777, 011-46194650 (Delhi), 040-42467777 (Hyderabad), or 080-46668222 (Bangalore). You will soon be able to contact Visas Avenue expert in Mumbai city as well with the new branch opening in the film city in the New Year 2017. You may also send your Canada immigration queries to email id- info@visasavenue.com.